Proprietary Name: Winrho Sdf What is the Proprietary Name? Non-Proprietary Name: Rho(d) Immune Globulin Intravenous (human) What is the Non-Proprietary Name? 70257 - Saol Therapeutics Inc.
Winrho Sdf with NDC 70257-330 is a a human prescription drug product labeled by Saol Therapeutics Inc.. The generic name of Winrho Sdf is rho(d) immune globulin intravenous (human). The product's dosage form is injection and is administered via intramuscular; intravenous form. Labeler Name: Saol Therapeutics Inc.
FDA Application Number: BLA103649 What is the FDA Application Number? This warning does not apply to Rho(D)-negative patients treated for the suppression of Rh isoimmunization.Intravascular hemolysis (IVH) leading to death has been reported in patients treated with WinRho SDF for immune thrombocytopenic purpura (ITP).IVH can lead to clinically compromising anemia and multi-system organ failure including acute respiratory distress syndrome (ARDS).Serious complications including severe anemia, acute renal insufficiency, renal failure and disseminated intravascular coagulation (DIC) have also been reported.Closely monitor patients treated with WinRho SDF for ITP in a healthcare setting for at least 8 hours after administration. A dipstick urinalysis to monitor for hematuria and hemoglobinuria is to be performed at baseline and then after administration at 2 hours, 4 hours and prior to the end of the monitoring period. Alert patients and monitor the signs and symptoms of IVH including back pain, shaking chills, fever, and discolored urine or hemoglobinuria. Absence of these signs and/or symptoms of IVH within 8 hours do not indicate IVH cannot occur subsequently. If signs and/or symptoms of IVH are present or suspected after WinRho SDF administration, post-treatment laboratory tests should be performed including plasma hemoglobin, haptoglobin, LDH, and plasma bilirubin (direct and indirect). WinRho® SDF is a Rho(D) Immune Globulin Intravenous (Human) (anti-D) product that is indicated for the treatment of ITP in Rho(D)-positive patients and for the suppression of Rh isoimmunization in non-sensitized Rho(D)-negative patients. 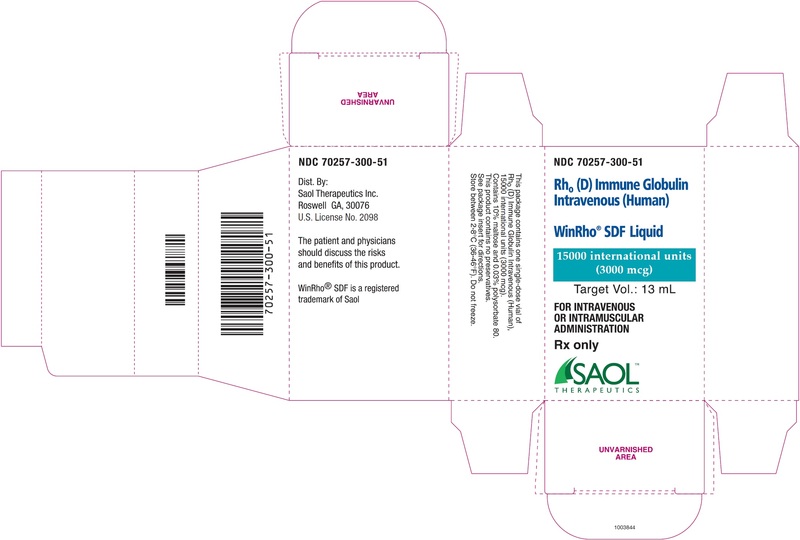 WinRho SDF is indicated for use in clinical situations requiring an increase in platelet count to prevent excessive hemorrhage in the treatment of non-splenectomized, Rho(D)-positivechildren with chronic or acute ITPadults with chronic ITPchildren and adults with ITP secondary to HIV infectionThe safety and efficacy of WinRho SDF have not been evaluated in clinical trials for patients with non-ITP causes of thrombocytopenia or in previously splenectomized patients or in patients who are Rho(D)-negative. – Obstetric complication (e.g., miscarriage, abortion, threatened abortion, ectopic pregnancy or hydatidiform mole, transplancental hemorrhage resulting from antepartum hemorrhage)– Invasive procedures during pregnancy (e.g., amniocentesis, chorionic biopsy) or obstetric manipulative procedures (e.g., external version, abdominal trauma)An Rh-incompatible pregnancy is assumed if the fetus/baby is either Rho(D)-positive or Rho(D)-unknown or if the father is either Rho(D)-positive or Rho(D)-unknown.Incompatible TransfusionsWinRho SDF is indicated for the suppression of Rh isoimmunization in Rho(D)-negative individuals transfused with Rho(D)-positive red blood cells (RBCs) or blood components containing Rho(D)-positive RBCs.WinRho SDF is not indicated for use as immunoglobulin replacement therapy for immune globulin deficiency syndromes. For intravenous or intramuscular use only. Bring WinRho SDF to room temperature prior to use.Inspect WinRho SDF for particulate matter and discoloration prior to administration. Do not use if the solution is cloudy or contains particulates.WinRho SDF is for single use only. Discard any unused portion.The solution is ready to use, no reconstitution required. See Table 4 for the target fill volumes for each of the dosage sizes for WinRho SDF. Table 4 Liquid WinRho SDF Dosage Size and Target Fill VolumesVial SizeTarget Fill Volume600 IU (120 mcg)0.5 mL1,500 IU (300 mcg)1.3 mL2,500 IU (500 mcg)2.2 mL5,000 IU (1,000 mcg)4.4 mL15,000 IU (3,000 mcg)13.0 mLNote: Remove the entire contents of the vial to obtain the labelled dosage of WinRho SDF. If partial vials are required for dosage calculation, withdraw the entire contents of the vial to ensure accurate calculation of the dosage requirement. For ease in withdrawing the contents of the vial, draw back the plunger of a sterile syringe (with the needle and needle cover in place) to admit air into the syringe. Depress the plunger of the syringe to inject air into the vial. Invert vial and aspirate contents of vial into syringe. ITPAdminister WinRho SDF by the INTRAVENOUS ROUTE ONLY.Administer the entire dose of WinRho SDF into a suitable vein over three to five minutes.Administer WinRho SDF separately from other drugs.If dilution of WinRho SDF is preferred prior to intravenous administration, use normal saline as diluent. Do not use Dextrose (5%) in water (D5W). No other diluents have been tested.Suppression of Rh IsoimmunizationMay be administered intravenously or intramuscularly.For intravenous administration, administer WinRho SDF separately from other drugs. WinRho SDF should be administered at a rate of 2 mL per 5 to 15 seconds.For intramuscular administration, administer into the deltoid muscle of the upper arm or the anterolateral aspects of the upper thigh. Due to the risk of sciatic nerve injury, avoid the gluteal region. If the gluteal region is used, use only the upper, outer quadrant. WinRho SDF, Rho(D) Immune Globulin Intravenous (Human), is available as a ready to use solution for injection available in single dose vials of 600 IU (120 mcg), 1,500 IU (300 mcg), 2,500 IU (500 mcg), 5,000 IU (1,000 mcg) and 15,000 IU (3,000 mcg). 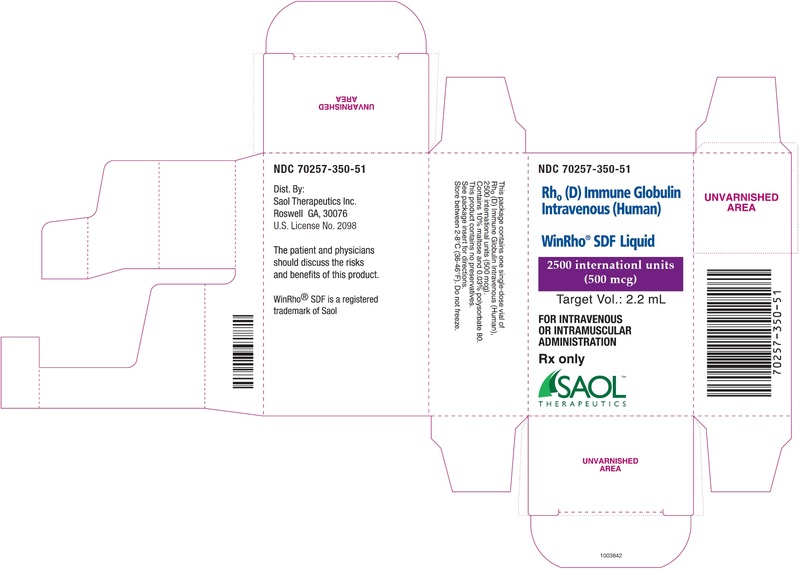 WinRho SDF is contraindicated in:Patients who have had known anaphylactic or severe systemic reaction to the administration of human immune globulin products.IgA-deficient patients with antibodies to IgA or a history of hypersensitivity reaction to WinRho SDF or any of its components.Patients with autoimmune hemolytic anemia, with pre-existing hemolysis or at high risk for hemolysis.Infants for the suppression of Rho(D) isoimmunization. Severe hypersensitivity reactions may occur [see Contraindications (4)]. If symptoms of allergic or early signs of hypersensitivity reactions (including generalized urticaria, tightness of the chest, wheezing, hypotension, and anaphylaxis) occur, discontinue WinRho SDF infusion immediately and institute appropriate treatment. WinRho SDF should be administered in a setting where appropriate equipment, medication such as epinephrine, and personnel trained in the management of hypersensitivity, anaphylaxis and shock are available.WinRho SDF contains ≤ 40 µg/mL IgA [see Description (11)]. Patients with antibodies to IgA have a greater risk of developing potentially severe hypersensitivity and anaphylactic reactions. WinRho SDF is contraindicated in IgA-deficient patients with antibodies to IgA or a history of hypersensitivity reaction to WinRho SDF or any of its components [see Contraindications (4)]. IVH leading to death has been reported in patients treated for ITP with WinRho SDF.IVH can lead to clinically compromising anemia and multi-system organ failure including acute respiratory distress syndrome (ARDS).Serious complications including severe anemia, acute renal insufficiency, renal failure and disseminated intravascular coagulation (DIC) have also been reported.7,8Closely monitor patients treated with WinRho SDF for ITP in a healthcare setting for at least 8 hours after administration. Perform a dipstick urinalysis to monitor for hematuria and hemoglobinuria at baseline and then after administration at 2 hours, 4 hours and prior to the end of the monitoring period. Alert patients and monitor for signs and symptoms of IVH including back pain, shaking chills, fever, and discolored urine or hemoglobinuria. Absence of these signs and/or symptoms of IVH within eight hours do not indicate IVH cannot occur subsequently. If signs and/or symptoms of IVH are present or if IVH is suspected after WinRho SDF administration, perform post-treatment laboratory tests including plasma hemoglobin, haptoglobin, LDH, and plasma bilirubin (direct and indirect). Although the mechanism of action of WinRho SDF in the treatment of ITP is not completely understood it is postulated that anti-D binds to the Rho(D) RBC resulting in formation of antibody-coated RBC complexes. Immune-mediated clearance of the antibody-coated RBC complexes would spare the antibody-coated platelets because of the preferential destruction of antibody-coated RBC complexes by the macrophages located in the reticuloendothelial system.9-11 The side effect of this action is a decrease in hemoglobin levels (extravascular hemolysis).7 The pooled data from ITP clinical studies demonstrated a mean decrease from baseline in hemoglobin levels of 1.2 g/dL within 7 days after administration of WinRho SDF.In patients with pre-disposing conditions, renal and cardiovascular complications of IVH may occur more frequently. Patients of advanced age (age over 65 years) with co-morbid conditions may be at an increased risk of developing sequelae from acute hemolytic reactions. If a patient has evidence of hemolysis (reticulocytosis greater than 3%) or is at high risk for hemolysis [positive direct antiglobulin test (DAT) not attributed to previous immune globulin administration], alternate therapies must be used.If the patient has lower than normal hemoglobin levels (less than 10 g/dL), a reduced dose of 125 to 200 IU/kg (25 to 40 mcg/kg) should be given to minimize the risk of increasing the severity of anemia in the patient. Alternative treatments should be used in patients with hemoglobin levels that are less than 8 g/dL due to the risk of increasing the severity of the anemia [see Dose (2.1)].Significant anemia may present with pallor, hypotension, or tachycardia while acute renal insufficiency may present with oliguria or anuria, edema and dyspnea. Patients with IVH who develop DIC may exhibit signs and symptoms of increased bruising and prolongation of bleeding time and clotting time which may be difficult to detect in the ITP population. Consequently, the diagnosis of this serious complication of IVH is dependent on laboratory testing [see Warnings and Precautions (5.9)]. Previous uneventful administration of WinRho SDF does not preclude the possibility of an occurrence of IVH and its complications following any subsequent administration of WinRho SDF. Have confirmatory laboratory testing on ITP patients presenting with signs and/or symptoms of IVH and its complications after anti-D administration [see Warnings and Precautions (5.9)]If ITP patients are to be transfused, use Rho(D)-negative red blood cells (PRBCs) so as not to exacerbate ongoing hemolysis. Because WinRho SDF is made from human plasma; it may carry a risk of transmitting infectious agents, e.g., viruses and theoretically, the Creutzfeldt-Jakob disease (CJD) agent. The risk of transmitting an infectious agent has been reduced by screening plasma donors for prior exposure to certain pathogens, testing for the presence of certain current viral infections, and including virus inactivation/removal steps in the manufacturing process [see Description (11)].Report all infections thought to have been transmitted by WinRho SDF to Saol Therapeutics Inc. at 1-833-644-4216. The physician should discuss the risks and benefits of this product with the patient. Acute renal insufficiency/failure, osmotic nephropathy, acute tubular necrosis, proximal tubular nephropathy, and death may occur upon use of Immune Globulin Intravenous (IGIV) products, including WinRho SDF.2 Ensure that patients are not volume depleted before administering WinRho SDF. For patients at risk of renal insufficiency or failure, including those with any degree of pre-existing renal insufficiency, diabetes mellitus, advanced age (above 65 years of age), volume depletion, sepsis, paraproteinemia, or receiving known nephrotoxic drugs, administer WinRho SDF at the minimum infusion rate practicable and assess renal function, including measurement of blood urea nitrogen (BUN) and serum creatinine, before the initial infusion of WinRho SDF and at appropriate intervals thereafter. Thromboembolic events may occur during or following treatment with WinRho SDF and other IGIV products.3,4 Patients at risk include those with a history of atherosclerosis, multiple cardiovascular risk factors, advanced age, impaired cardiac output, coagulation disorders, prolonged periods of immobilization, history of arterial or venous thrombosis, estrogen use, indwelling central vascular catheters, and/or known/suspected hyperviscosity. Thrombosis may occur in the absence of known risk factors.Consider baseline assessment of blood viscosity in patients at risk for hyperviscosity including those with cryoglobulins, fasting chylomicronemia/markedly high triacylglycerols (triglycerides), or monoclonal gammopathies. For patients who are at risk of developing thromboembolic events, administer WinRho SDF at the minimum rate of infusion practicable. After administration of WinRho SDF, a transitory increase of various passively transferred antibodies in the patient’s blood may yield positive serological testing results, with the potential for misleading interpretation. Passive transmission of antibodies to erythrocyte antigens (e.g., A, B, C and E) and other blood group antibodies [for example, anti Duffy, anti Kidd (anti JKa) antibodies]5 may cause a positive direct or indirect (Coombs’) test.A large fetomaternal hemorrhage late in pregnancy or following delivery may cause a weak mixed field positive Du test result. Assess such an individual for a large fetomaternal hemorrhage and adjust the dose of WinRho SDF accordingly. The presence of passively administered anti Rho(D) in maternal or fetal blood can lead to a positive direct Coombs’ test. If there is an uncertainty about the father’s Rh group or immune status, administer WinRho SDF to the mother. Non-cardiogenic pulmonary edema may occur in patients following IGIV treatment, including WinRho SDF.6 TRALI is characterized by severe respiratory distress, pulmonary edema, hypoxemia, normal left ventricular function, and fever. Symptoms typically appear within 1 to 6 hours following administration of blood products.Monitor patients for pulmonary adverse reaction. If TRALI is suspected, perform appropriate tests for the presence of anti-neutrophil antibodies and anti-HLA antibodies in both the product and patient serum. TRALI may be managed using oxygen therapy with adequate ventilatory support. For all ITP patients, blood type, blood count, reticulocyte count, DAT and dipstick urinalysis are recommended before deciding to treat patients with WinRho SDF. In patients with evidence of hemolysis (reticulocytosis greater than 3%), or patients at risk of hemolysis (positive DAT not attributed to previous immune globulin administration) use other treatments.1Closely monitor patients administered WinRho SDF for at least 8 hours post administration and perform a dipstick urinalysis to monitor for hematuria and hemoglobinuria at baseline and then after administration at 2 hours, 4 hours and prior to the end of the monitoring period.If signs and/or symptoms of IVH and its complications are present after anti-D administration, perform appropriate confirmatory laboratory testing including, but not limited to, CBC (i.e. hemoglobin, platelet counts), haptoglobin, plasma hemoglobin, urine dipstick, assessment of renal function (i.e. BUN, serum creatinine), liver function (i.e. LDH, direct and indirect bilirubin) and DIC specific tests such as D-dimer or Fibrin Degradation Products (FDP) or Fibrin Split Products (FSP).Periodic monitoring of renal function and urine output in patients who are at increased risk of developing acute renal failure [see Warnings and Precautions (5.5)]. Assess renal function in these at-risk patients, including measurement of BUN and serum creatinine, before the initial infusion of WinRho SDF and at appropriate intervals thereafter.If TRALI is suspected in ITP patients, perform appropriate tests for the presence of anti-neutrophil antibodies in both the product and patient serum [see Warnings and Precautions (5.9)]. The liquid formulation of WinRho SDF contains maltose. Maltose in IGIV products has been shown to give falsely high blood glucose levels in certain types of blood glucose testing systems [for example, by systems based on glucose dehydrogenase pyrroloquinolinequinone (GDH-PQQ) or glucose-dye-oxidoreductase methods]. Due to the potential for falsely elevated glucose readings, only use testing systems that are glucose-specific to test or monitor blood glucose levels in patients receiving maltose-containing parenteral products, including WinRho SDF Liquid.Carefully review the product information of the blood glucose testing system, including that of the test strips, to determine if the system is appropriate for use with maltose-containing parenteral products. If any uncertainty exists, contact the manufacturer of the testing system to determine if the system is appropriate for use with maltose-containing parenteral products. Do not administer WinRho SDF to Rho(D)-negative individuals who are Rh immunized as evidenced by an indirect antiglobulin (Coombs’) test revealing the presence of anti-Rho(D) (anti-D) antibody. For postpartum use following an Rh-incompatible pregnancy administer WinRho SDF to the mother only. Do not administer to the newborn infant. Serious adverse reactions, some of these cases resulted in fatal outcome, have been observed in patients receiving WinRho SDF for the treatment of ITP. These include: intravascular hemolysis (IVH), clinically compromising anemia, acute renal insufficiency and DIC [see Adverse Reactions, (6.2)]. The most common adverse reactions observed for all indications are: headache, chills, fever, asthenia, pallor, diarrhea, nausea, vomiting, arthralgia, myalgia, dizziness, hyperkinesia, abdominal or back pain, hypotension, hypertension, increased LDH, somnolence, vasodilation, pruritus, rash and sweating. All adverse reactions listed occurred in ≤ 2% of WinRho® doses administered in clinical trials.Adverse reactions observed in the use of WinRho SDF for Suppression of Rh Isoimmunization are < 0.1% in Rho(D)-negative individuals. Because clinical studies are conducted under different protocols and widely varying conditions, adverse reaction rates observed in the clinical trials of a specific drug product cannot be directly compared to rates in clinical trials of another drug, and may not reflect rates observed in practice.Treatment of ITPThe safety of WinRho® SDF was evaluated in clinical trials (n=161) in children and adults with acute and chronic ITP and adults and children with ITP secondary to HIV. Overall, 417 adverse events were reported by 91 patients (57%). The most common adverse events were headache (14% of the patients), fever (11% of the patients) and asthenia (11% of the patients). A total of 117 adverse drug reactions were reported by 46 patients (29%). Headache, chills, and fever were the most common related adverse events (Table 5). With respect to safety profile per administration, 60/848 (7%) of WinRho infusions had at least one adverse reaction. The most common adverse reactions were headache (19 infusions; 2%), chills (14 infusions; < 2%), and fever (9 infusions; 1%). Table 5 Adverse Drug Reactions with an Incidence ≥ 5% of PatientsBody SystemAdverse EventAll StudiesChildrenAdults# of Patients (%)Body as a WholeHeadache18 (11)8 (11)10 (12)Chills13 (8)4 (5) 9 (10)Fever 9 (6)5 (7)4 (5)Asthenia 6 (4)2 (3)4 (5)Infection4 (3)4 (5)0 (0)Nervous SystemDizziness6 (4)2 (3)4 (5)In four clinical trials of patients treated with the recommended initial intravenous dose of 250 IU/kg (50 mcg/kg), the mean maximum decrease in hemoglobin was 1.70 g/dL (range: +0.40 to -6.1g/dL). At a reduced dose, ranging from 125 to 200 IU/kg (25 to 40 mcg/kg), the mean maximum decrease in hemoglobin was 0.81 g/dL (range: +0.65 to -1.9 g/dL). Only 5/137 (3.7%) of patients had a maximum decrease in hemoglobin of greater than 4 g/dL (range: -4.2 to -6.1 g/dL).Suppression of Rh IsoimmunizationIn the clinical trial of 1,186 Rho(D)-negative pregnant women, no adverse reactions were reported to Rho(D) IGIV. The following adverse reactions listed by body system have been identified during the post-approval use of WinRho SDF. Because post-marketing adverse reactions are reported voluntarily from a population of uncertain size, it is not always possible to reliably estimate their frequency or establish a causal relationship to product exposure. Intravascular hemolysis (IVH) leading to death has been reported in patients treated with WinRho SDF for immune thrombocytopenic purpura (ITP).Serious complications including severe anemia, acute renal insufficiency, renal failure and disseminated intravascular coagulation (DIC) have also been reported. Blood and Lymphatic:Intravascular hemolysis, disseminated Intravascular coagulation, hemoglobinemia Cardiac:Cardiac arrest, cardiac failure, myocardial infarction, tachycardia Gastrointestinal:Nausea General:Chest pain, fatigue, edema, pain Hepatobilliary:Jaundice Immune System:Anaphylactic reaction/shock, hypersensitivity, injection site reaction including induration, pruritus and/or swelling Musculoskeletal:Myalgia, muscle spasm, pain in extremities Renal:Renal failure, anuria, chromaturia, hematuria, hemoglobinuria Respiratory:Acute respiratory distress syndrome, dyspnea, transfusion related acute lung injury Skin:Hyperhidrosis, pruritus, rashHealthcare professionals should report serious adverse reactions following the administration of WinRho SDF to Saol Therapeutics Inc. at 1-833-644-4216 or FDA’s MedWatch reporting system by phone (1-800-FDA-1088). Administration of WinRho SDF concomitantly with other drugs has not been evaluated. Passive transfer of antibodies may transiently impair the immune response to live attenuated virus vaccines such as measles, mumps, rubella, and varicella (see Patient Counseling Information [17.1]). Do not give immunization with live vaccines within 3 months after WinRho SDF administration. Risk SummaryThere is no information regarding the presence of WinRho SDF in human milk, the effect on the breastfed infant, and the effects on milk production. The developmental and health benefits of breastfeeding should be considered along with the mother’s clinical need for WinRho SDF and any potential adverse effects on the breastfed infant from WinRho SDF or from the underlying maternal condition. The safety and effectiveness of WinRho has been evaluated for the treatment of chronic or acute ITP in children and in children (<16 years of age) with ITP secondary to HIV infection [see Adverse Reactions (6.2)]. The dosing recommendation in the treatment of children with ITP is the same as in adults [see Dosage and Administration (2.1)]. Clinical studies of WinRho did not include sufficient numbers of subjects aged 65 and over to determine whether they respond differently from younger subjects. Post marketing clinical experience suggests that patients of advanced age (age over 65) with co-morbid conditions including but not limited to cardio-respiratory decompensation, renal failure or insufficiency or prothrombotic conditions are at increased risk of developing serious complications from acute hemolytic reactions such as IVH. Patients receiving doses in excess of 300 IU/kg of WinRho SDF may also be at an increased risk of developing increased hemolysis. Fatal outcomes associated with IVH and its complications have occurred most frequently in patients of advanced age (age over 65) with co-morbid conditions.Given the prevalence of co-morbid conditions and concomitant drug therapy in geriatric patients, consider starting at the low end of the dosing range when using WinRho SDF in this population. Treatment of ITP and Suppression of Rh Isoimmunization In post-marketing spontaneous reporting, there has been a limited number of medication error reports related to dosage calculations in which higher doses than that recommended for WinRho SDF were administered (doses > 60 µg/kg). Signs and laboratory findings of overdosage in Rh positive (ITP) patients have included hemoglobin decreases in excess of 1.2 g/dL. For the suppression of Rh isoimmunization, hemolytic reactions have been reported in cases of mis-matched blood transfusions where very large doses of WinRho SDF were administered. In one ITP case report that involved an overdose due to confusion between mcg and international unit (IU), a patient with significant co-morbidities developed IVH and had a fatal outcome. In the event of overdose, monitor patients closely for signs and symptoms of hemolysis and initiate symptomatic and supportive treatment. WinRho SDF is a sterile, liquid gamma globulin (IgG) fraction containing antibodies to the Rho(D) antigen (D antigen). WinRho SDF is to be administered intravenously for the treatment of ITP and either intravenously or intramuscularly for the suppression of Rh isoimmunization. WinRho SDF is prepared from human plasma by an anion-exchange column chromatography method. The manufacturing process includes two steps implemented specifically for viral clearance. The solvent detergent treatment step (using tri-n-butyl phosphate and octoxynol is effective in inactivating lipid enveloped viruses such as hepatitis B, hepatitis C, and HIV. Virus filtration, using a 20N virus filter, is effective in the removal of some non-lipid enveloped viruses. These two processes are designed to increase product safety by reducing the risk of transmission of enveloped and non-enveloped viruses, respectively. In addition to the two specific steps, the anion-exchange chromatography step contributes to the removal of small non-lipid enveloped viruses.The inactivation and reduction of known enveloped and non-enveloped model viruses were validated in laboratory studies as summarized in Table 6.Table 6 Virus Reduction Values Obtained Through Validation Studies* The PRV was retained by the 0.1 µm pre-filter during the virus validation. Since manufacturing employs a 0.1 µm pre-filter before the 20N filter, the claim of ≥5.6 reduction is considered applicable.Abbreviations:HIV-1: human immunodeficiency virus-1; relevant virus for human immunodeficiency virus-1 and model for HIV-2.BVDV: bovine viral diarrhea virus; model virus for hepatitis C virus (HCV) and West Nile virus (WNV)PRV: pseudorabies virus; model for large enveloped DNA viruses, including herpesHAV: human hepatitis A virus; relevant virus for HAV and model for small non-enveloped viruses in generalEMC: encephalomyocarditis virus; model for HAV and for small non-enveloped viruses in generalMMV: murine minute virus; model for human parvovirus B19 and for small non-enveloped viruses in generalPPV: porcine parvovirus; model for human parvovirus B19 and for small non-enveloped viruses in generaln.e. : not evaluatedEnvelopedNon-EnvelopedGenomeRNADNARNADNAVirusHIV-1BVDVPRVHAVEMCMMVPPVFamilyretroflaviherpespicornaparvoSize (nm)80-10050-70120-20025-303020-2518-24Anion Exchange Chromatography (partitioning)n.e.2.3n.e.3.4n.e.20N Filtration (size exclusion)≥ 4.7≥ 3.5≥ 5.6*n.e.4.8n.e.4.1Solvent/Detergent (inactivation)≥ 4.7≥ 7.3≥ 5.5n.e.Total Reduction (log10)≥ 9.4≥ 10.8≥ 11.12.34.83.44.1The product potency is expressed in international units (IU) by comparison to the World Health Organization (WHO) standard. In the past, a full dose of Rho(D) Immune Globulin (Human) has traditionally been referred to as a “300 microgram (mcg)” dose. Potency and dosing recommendations are now expressed in IU by comparison to the WHO anti-Rho(D) standard. The conversion of mcg to IU is: 1 mcg = 5 IU. A 1,500 IU (300 mcg) vial contains sufficient anti-Rho(D) to effectively suppress the immunizing potential of approximately 17 mL of Rho(D) (D-positive) RBCs. The liquid formulation is stabilized with 10% maltose and 0.03% polysorbate 80. There are no preservatives in the formulation. WinRho SDF does not contain mercury. This product contains ≤ 40 µg/mL IgA. Treatment of ITPWinRho SDF has been shown to increase platelet counts in non-splenectomized, Rho(D)-positive patients with ITP. Platelet counts usually rise within one to two days and peak within seven to 14 days after initiation of therapy. The mechanism of action is not completely understood, but is thought to be due to the formation of anti-Rho(D)-coated RBC complexes, which are preferentially removed by the reticuloendothelial system, particularly the spleen. This results in Fc receptor blockade, thus sparing antibody-coated platelets.9,10Suppression of Rh IsoimmunizationThe mechanism by which Rho(D) immune globulin suppresses immunization to Rho(D)-positive RBCs is not completely understood. WinRho SDF when administered within 72 hours of a full-term delivery of a Rho(D)-positive infant by a Rho(D) negative mother will reduce the incidence of Rh isoimmunization from 12-13% to 1-2%. The 1-2% is, for the most part, due to isoimmunization during the last trimester of pregnancy. When treatment is given both antenatally, at 28-weeks gestation, and postpartum, the Rh immunization rate drops to about 0.1%.13,14When 600 IU (120 mcg) of WinRho SDF is administered to pregnant women, passive anti-Rho(D) antibodies are not detectable in the circulation for more than six weeks and therefore a dose of 1,500 IU (300 mcg) should be used for antenatal administration. In a clinical study with Rho(D)-negative volunteers (nine males and one female), Rho(D)-positive RBCs were completely cleared from the circulation within 8hours of intravenous administration of WinRho. There was no indication of Rh isoimmunization of these subjects at six months after the clearance of the Rho(D)-positive RBCs. IM versus IV Administration (Lyophilized Powder)In a clinical study involving Rho(D)-negative volunteers, two subjects received 600 IU (120 mcg) WinRho by intravenous (IV) administration and two subjects received this dose by intramuscular (IM) administration. Peak levels (36 to 48 ng/mL) were reached within two hours of IV administration and peak levels (18 to 19 ng/mL) were reached at five to 10 days after IM administration. Although no statistical comparisons were made, the calculated areas under the curve were comparable for both routes of administration. The t½ for anti-Rho(D) was about 24 days following IV administration and about 30 days following IM administration.Lyophilized Powder versus Liquid FormulationIn two comparative pharmacokinetics studies, 101 volunteers were administered the liquid or lyophilized formulation of WinRho SDF intravenously (n=41) or intramuscularly (n=60). The formulations were bioequivalent following IV administration based on area under the curve to 84 days and had comparable pharmacokinetics following IM administration. The average peak concentrations (Cmax) of anti-Rho(D) for both formulations were comparable following IV or IM administration and occurred within 30 minutes or 2-4 days of administration, respectively. Both formulations also had similar elimination half-lives (t½) following IV or IM administration. A study was conducted in 1,186 non-sensitized, Rho(D)-negative pregnant women in cases in which the blood types of the fathers were Rho(D)-positive or unknown. WinRho was administered according to one of three regimens: 1) 93 women received 600 IU (120 mcg) at 28 weeks; 2) 131 women received 1200 IU (240 mcg) each at 28 and 34 weeks; 3) 962 women received 1200 IU (240 mcg) at 28 weeks. All women received a postnatal administration of 600 IU (120 mcg) if the newborn was found to be Rho(D)-positive. Of 1,186 women who received antenatal WinRho, 806 were given WinRho postnatal following the delivery of a Rho(D)-positive infant, of which 325 women underwent testing at six months after delivery for evidence of Rh isoimmunization. Of these 325 women, 23 would have been expected to display signs of Rh isoimmunization, however, none was observed (p <0.001 in a Chi-square test of significance of difference between observed and expected isoimmunization in the absence of WinRho). Provan D, et al. : International consensus report on the investigation and management of primary immune thrombocytopenia. Blood 2010; 115:168-186.Gupta N, Ahmed I, Nissel-Horowitz S, Patel D, Mehrotra B. Intravenous gammaglobulin-associated acute renal failure. Am J Hematol 2001; 66:151-152Dalakas MC. High-dose intravenous immunoglobulin and serum viscosity: risk of precipitating thromboembolic events. Neurology 1994; 44:223-226.Woodruff RK, et al. : Fatal thrombotic events during treatment of autoimmune thrombocytopenia with intravenous immunoglobulin in elderly patients. Lancet 1986; 2:217-218.Rushin J, Rumsey, DH, Ewing, CA, Sandler, SG. Detection of multiple passively acquired alloantibodies following infusions of IV Rh immune globulins. Transfusion Vol. 40, May 2000.Rizk A, et al. : Transfusion-related acute lung injury after the infusion of IVIG. Transfusion 2001; 41:264-8.Gaines AR. Acute onset hemoglobinemia and/or hemoglobinuria and sequalae following Rho(D) immune globulin intravenous administration in immune thrombocytopenic purpura patients. Blood 2000; 95(8): 2523-2529.Gaines AR. Disseminated intravascular coagulation associated with acute hemoglobinemia and/or hemoglobinuria following Rho(D) immune globulin intravenous administration for immune thrombocytopenic purpura. Blood 2005; 106(5); 1532-7.Ballow, M: Mechanisms of action of intravenous immunoglobulin therapy and potential use in autoimmune connective tissue diseases. Cancer. 1991; 68:1430-1436.Kniker, WT: Immunosuppressive agents, γ-globulin, immunomodulation, immunization, and apheresis. J. Aller. Clin. Immunol. 1989; 84:1104-1106.Lazarus AH, Crow AR. Mechanism of action of IVIG and anti-D in ITP. Transfus Apheresis Sci 2003; 28:249-255.Bowman JM. The prevention of Rh immunization. Transfus Med Rev 1988; 2(3):129-150Bowman, JM, and Pollock, JM: Failures of intravenous Rh immune globulin prophylaxis: An analysis of the reasons for such failures. Trans. Med. Rev. 1987; 1:101-111.Bowman, JM: Antenatal suppression of Rh alloimmunization. Clin Obstet. & Gynec. 1991; 34:296-303.Andrew, M, et al. : A multicenter study of the treatment of childhood chronic idiopathic thrombocytopenic purpura with anti-D. J Pediatrics 1992; 120:522-527.Blanchette, V, et al. : Randomised trial of intravenous immunoglobulin G, intravenous anti-D, and oral prednisone in childhood acute immune thrombocytopenic purpura. Lancet 1994; 344: 703-707.Zunich KM, et al. Intravenous anti-D immunoglobulin for childhood acute immune thrombocytopenic purpura. Lancet 1995; 346:1363-5.Scaradavou A, et al. : Intravenous anti-D treatment of immune thrombocytopenic purpura: experience in 272 patients. Blood 1997; 89:2689-700.Bussel, JB, et al. : Intravenous anti-D treatment of immune thrombocytopenic purpura: Analysis of efficacy, toxicity, and mechanism of effect. Blood 1991; 77: 1884-1893.Zunich KM, et al. : Treatment of human immunodeficiency virus-related thrombocytopenia with intravenous anti-rhesus D immunoglobulin. Clin Infect Dis 1996; 22:1129-30. Information for PatientsSee FDA-Approved Patient LabelingITP and Suppression of Rh IsoimmunizationInform patients of the early signs of hypersensitivity reactions to WinRho SDF including hives, generalized urticaria, chest tightness, wheezing, hypotension, and anaphylaxis.Advise patients to notify their physicians if they experience any of the above symptoms.Blood Glucose MonitoringAdvise patients that the maltose contained in WinRho SDF can interfere with some types of blood glucose monitoring systems.Advise patients to use only testing systems that are glucose specific for monitoring blood glucose levels as the interference of maltose could result in falsely elevated glucose readings. This could lead to untreated hypoglycemia or to inappropriate insulin administration, resulting in life-threatening hypoglycemia.Transmittable Infectious AgentsInform patients that WinRho SDF is prepared from human plasma and may contain infectious agents (e.g., viruses and, theoretically, the CJD agent) that can cause disease. The risk that such products will transmit an infectious agent has been reduced by screening plasma donors for prior exposure to certain viruses, by testing for the presence of current virus infections, and by inactivating and/or removing certain viruses during manufacturing.Advise patients to report any symptoms that concern them and that may be related to viral infections.Live Virus VaccinesAdvise patients that WinRho SDF may impair the effectiveness of certain live virus vaccines (e.g., measles, rubella, mumps, and varicella).Instruct patients to notify their treating physician of this potential interaction when they are receiving vaccinations.Immune Thrombocytopenic Purpura (ITP)Instruct patients being treated with WinRho SDF for ITP to immediately report symptoms of intravascular hemolysis including back pain, shaking chills, fever, discolored urine, decreased urine output, sudden weight gain, fluid retention/edema, and/or shortness of breath to their physicians. Prior to discharge, instruct patients to continue to self-monitor for the signs and symptoms of IVH over 72 hours, especially for discoloration of urine, and to seek medical attention immediately in the event that signs/symptoms of IVH occur following WinRho SDF administration.Laboratory Tests Assess renal function in patients judged to be at an increased risk of developing acute renal failure, including measurement of BUN and serum creatinine, before the initial infusion of WinRho SDF. WinRho SDF[pronounced win – row –S-D-F]You should read this leaflet carefully each time before you are scheduled to receive a treatment for your Immune Thrombocytopenic Purpura (ITP) with WinRho SDF. This letter is a summary of the important information you need to know about your medicine, and does not take the place of talking with your doctor and does not contain all of the information available about WinRho SDF. If you have any questions after reading this leaflet, make sure you ask your doctor or nurse.1. What is the most important information I should know about WinRho SDF?Some patients taking WinRho SDF for immune thrombocytopenic purpura (ITP) have had severe, life threatening bleeding and clotting problems. For this reason, you need to remain under observation for at least 8 hours following each treatment with WinRho SDF and your doctor will ask you to take blood and urine tests before and after infusion with WinRho SDF.Some patients taking WinRho SDF have had problems with their kidneys and other organs.Problems usually occur within 4 to 8 hours after getting an infusion. Tell your doctor or healthcare provider right away if you have any of the following signs or symptoms after getting a WinRho SDF infusion:back painshakingchillsfeverdark or oddly colored urinedecreased urinationswelling or sudden weight gainshortness of breathrashdizzinessContinue monitoring for these signs and symptoms for 72 hours after each treatment with WinRho SDF.WinRho SDF contains maltose, which can give false readings on some glucose testing meters. If you are diabetic, ask your doctor what types of glucose testing meters can be used safely while you are getting WinRho SDF.2. What is WinRho SDF?WinRho SDF is a protein product, called an “immune globulin,” which is made from human plasma. It has antibodies to the “D” antigen that people with “Rh-positive” blood have in their blood.WinRho SDF is used to increase the number of platelets in the blood of Rh-positive people who have a problem called immune thrombocytopenic purpura (ITP). People with ITP bruise and bleed easily because they have a very low number of platelets in their blood.WinRho SDF is also used to treat Rh-negative girls and women who need a blood transfusion using Rh-positive blood and/or are carrying an Rh-positive baby.3. Who should not use WinRho SDF?You should not use WinRho SDF for any treatment if you: have ever had a severe allergic reaction (such as trouble breathing, hives, passing out) after getting any blood product or blood product transfusion.have an immune globulin A (IgA) deficiency.You should not use WinRho SDF for treatment of ITP if you:have Rh-negative blood.have had your spleen removed.have a problem called “autoimmune hemolytic anemia.”have other pre-existing bleeding problems.4. How will I get WinRho SDF?Your doctor will give you WinRho SDF as an injection into your vein. For the treatment of ITP, it will usually take 3 to 5 minutes for an injection. Your doctor will decide if you need one or more injections.For protection against Rh-positive blood, your doctor may decide to give you WinRho SDF as a shot in your arm or thigh.5. What should I avoid while using WinRho SDF?WinRho SDF may interfere with your immune response to routine immunizations. Tell your doctor if you have recently been vaccinated or are planning to be vaccinated. WinRho SDF can interfere with certain blood tests. It is important to tell the person taking your blood and the doctor that you got WinRho SDF.6. What are the possible or reasonably likely side effects of WinRho SDF?The most common side effects of WinRho SDF areheadachechillsfeverweaknessdiarrheanausea and vomitingachy musclesfeeling light-headed or dizzinessfaintingflushingrashsweatingTell your doctor right away if you have:a fever over 100°Fshaking or chills that continue or get worsea painful lump or swelling (because this may be a sign of a blood clot)bruising that is increasing in diameter (because this may be a sign of a clotting problem)oddly colored urinetrouble urinatingsevere back painsevere abdominal painswelling, especially around the ankleshivesshortness of breathTalk to your doctor about any side effects that concern you.Additional prescribing information is available to healthcare professionals.7. What other information do I need to know about WinRho SDF?WinRho SDF is made from human plasma. Donors are carefully screened and the plasma is carefully cleaned, but it does have a very small risk of giving you viruses from the donor. Talk to your doctor if you have any symptoms that concern you. You may report side effects to Saol Therapeutics Inc. at 1-833-644-4216 or FDA’s MedWatch reporting system by phone (1-800-FDA-1088)WinRho® SDF [Rho(D) Immune Globulin Intravenous (Human)] Sterile Solution for Injection and any and all Saol brand, product, service and feature names, logos, slogans are trademarks or registered trademarks of Saol. All rights reserved.Distributed by:Saol Therapeutics Inc.